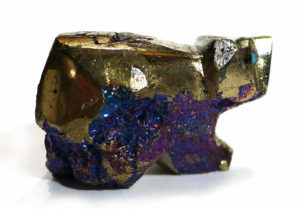 Bornite, especially in its colourful tarnished state, is child-like, innocent and playful. It reminds us of the joy of life, making it a good stone to have around in times of stress and overwork, and is also good for those who have chosen a life of service, while sometimes forgetting life can be light and full of laughter too. It can lift the spirits in times of grief and sadness, and increases energy levels (life force, Chi), giving us the will to carry on and enjoy what we are doing in our lives. 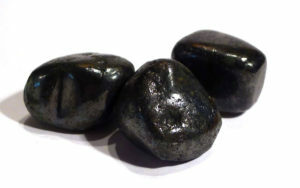 Bornite balances and clears the chakras. Its high copper content means it can be helpful in strengthening and supporting the body’s organs and general metabolic function, as well as acting as an anti-inflammatory for relief of pain and fever. Melody stresses the connection with metabolic function, and suggests it can strengthen and perfect cellular growth, and correct alterations of tissue formation – in other words, act in the prevention and treatment of cysts and tumours. Children are drawn to the iridescent colours. 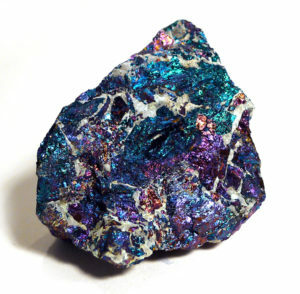 Bornite is a major copper ore. It forms primarily in hydrothermal veins in association with quartz, chalcopyrite, pyrite, and marcasite, and also in silica-poor pegmatites and contact metamorphic zones. It is usually massive and rarely crystallises. 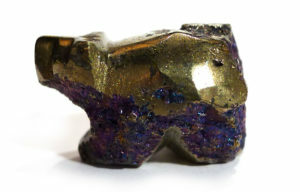 Colour is copper-red to bronze, tarnishing readily to a myriad of iridescent colours, when it is known as “peacock ore”. Bornite has gone through a number of name changes over the years. It was originally included with kupferkies in 1725 by Johann Friedrich Henckel, assigned various multi-word Latin names by Johan Gottschalk Wallerius in 1747, and further translated to purple copper ore and variegated copper ore in 1802 by Rene Just Haüy. It was also called buntkupfererz by Abraham Gottlieb Werner in 1791, phillipsite in 1832 by Wilhelm Sulpice Beudant, and finally renamed bornite in 1845 by Wilhelm Karl von Haidinger in honour of Ignaz von Born (1742-1791), Austrian mineralogist and invertebrate zoologist. There are no traditions associated with this mineral.